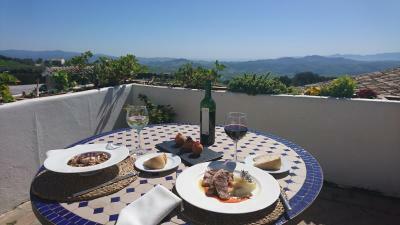 Lock in a great price for La Fuente del Sol – rated 9 by recent guests! Easy walking access to the city but just out of the city frenzy opposite a lovely green space. We had a lovely time. Added bonus was that they have rooms that take pets. Our dog loved running on their green grass and we enjoyed our swim in their salt water pool. What a lovely garden they have. The food was great too, though not cheap, I think it was reasonable considering its location. Shame I was too full to try their desert. Staff were all very friendly and knowledgeable too. Extremely helpful staff who let us use the hotel facilities after checkout for the whole afternoon as we had an evening flight out of Malaga. 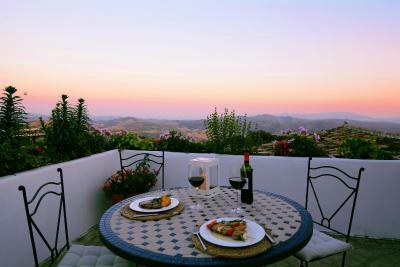 Food excellent, room excellent, location and views excellent. 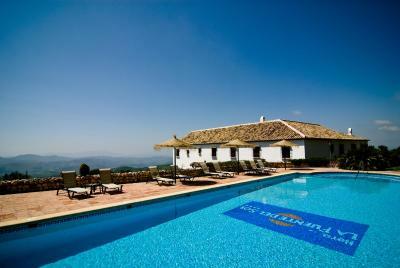 Without a doubt the best place we stayed at in andalusia. The drive to the hotel itself is not to be missed. Make sure to follow the sign to the hotel 6km ahead. The surround and the garden of the hotel is a reflection of Edens garden in spring time. The staff er very friendly and helpful. The restaurant uses own organic crops. 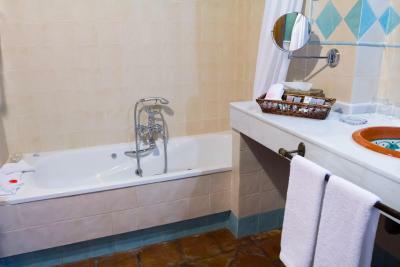 All supplies in the rooms are environmental friendly and rooms are very clean with a personal touch. On top of all these, we were upgraded to their superior room with no extra cost. Definitely the best stay and our only regret is that we were not able to stay longer due to our trip plans. Thank to hotel staff for a wonderful stay. We will not forget this place and have already recommended it to friends and family. The bungalow was a special place to stay. It was separate from the hotel but still close enough if you needed anything. Staff were excellent; very friendly, welcoming, helpful and always smiling. Breathtaking views!!!!!! Overall a fabulous hotel. I would definitely go back without a doubt!!! 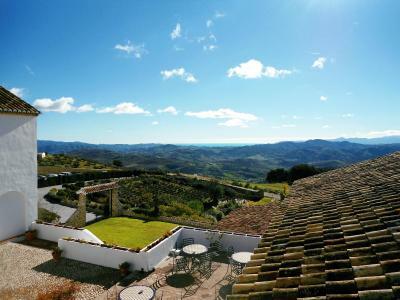 The perfect country property to relax in between our city stays. All fireplaces were lit and the property was nice and warm on this cold January evening. All staff were very friendly and helpful. We took a walk through the gardens and enjoyed the tranquility. The food in the restaurant was delicious - the waiter very attentive, knowledgeable and professional. Beautiful location and a very warm and welcoming hotel. They had a restaurant with great food and even offered horse riding trips. 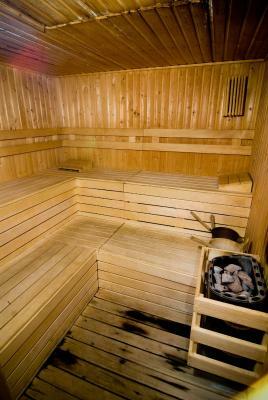 The room had floor heating which was especially pleasant as we were there in the winter. La Fuente del Sol This rating is a reflection of how the property compares to the industry standard when it comes to price, facilities and services available. It's based on a self-evaluation by the property. Use this rating to help choose your stay! The decoration and names of each bedroom have been inspired in the different floral species of the area. 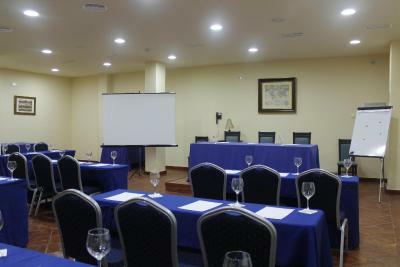 The hotel facilities are intended to induce relaxation and rest. 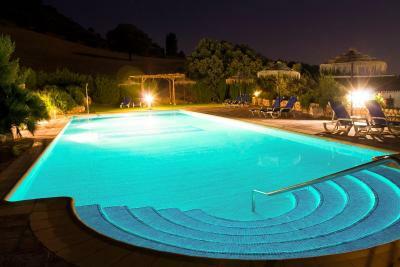 Hotel services include; a spa, large grounds and a restaurant. 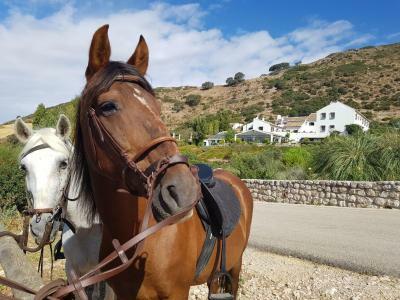 El Torcal de Antequera is a unique setting ideal for the practice of outdoor activities such as trekking, horseback riding and bird-watching. 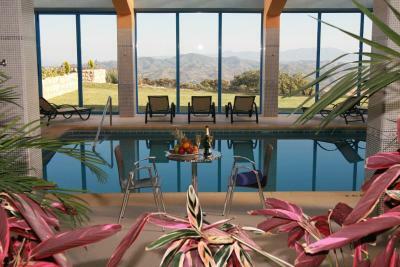 When would you like to stay at La Fuente del Sol? These rooms are uniquely decorated and feature a double bed or twin beds. They are distributed over 2 floors. The ones located on the upper floor feature high beamed ceilings, while the ones on the ground floor have private access to the hotel's public areas. This room comes with a private terrace and a spa bath. This suite has a separate lounge with a fireplace. It also comes with a hot tub. These individually decorated rooms are located on the top floor of the property. They have air conditioning, high ceilings with exposed beams and a spa bath. A mini-bar, a flat-screen TV and DVD player is also included. These rooms are uniquely decorated and feature a double bed. They feature satellite TV, mini-bar and CD player. This bungalow has a balcony, electric kettle and flat-screen TV. House Rules La Fuente del Sol takes special requests – add in the next step! La Fuente del Sol accepts these cards and reserves the right to temporarily hold an amount prior to arrival. 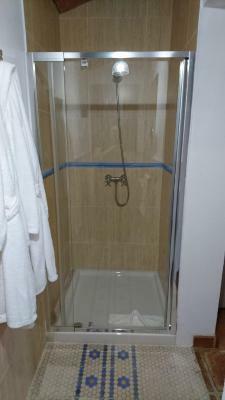 The shower was very powerful but the location of the holder when used resulted in the floor getting exceptionally wet. This might have only been a problem with our room. The buffet breakfast was exceptional and could accommodate all tastes. The evening menu had a large variety from meat, fish and vegetarian. The views from the hotel was fantastic and the sunset over the mountains in the distance was superb. To be charged over 13 euros per person for each 3 hour use of the pool, gym and saunna was appalling and was not including in booking information. Not acceptable. Top of a mountain,difficult access,no complimentary water. Spa shower was under repair so not able to use. location. far a way from the main road. but in the middle of a very nice landscape. breakfast was a little poor. The spa was the only thing that I didn't really enjoy. It seemed to be lacking in the sense that we were provided bathrobes but not towels, flip flops or shower caps and there were no lights in the changing room. It was not the worst spa I have ever been to but I feel it just needs a little TLC to make the experience more enjoyable. Only one thing - no vegetarian courses in the restaurant. The whole atmosphere. It was perfect. The road to the hotel was a bit rough with lots of potholes, so I suggest to do the drive during daylight.